– LED indicator for power and activity. - Support for password protection. – Customizable by inscribing a name, logo or image on the casing. 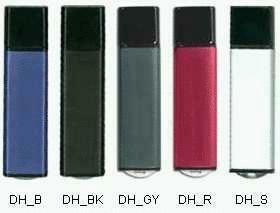 Now that we have that covered let me introduce to you the various D flash drives. - Plastic silver body with glossy paint or rubberized coating. - Dimensions: 65.5mm x 21.5mm x 10.4mm. - Transparent plastic casing, allowing a cool view of the interior. - Capacities: 128 – 512MB and 1 – 16GB. - Dimensions: 70.6mm x 19.6mm x 8.4mm. - Printable Area: 12mm x 41mm. - Plastic case with glossy paint or rubberized coating. - Color choices of solid or transparent, in black, blue, red, silver, gray or white. - Dimensions: 71.1mm x 19.4mm x 7.5mm. - Printable Area: 12mm x 38mm. - Plastic case with glossy paint or smooth rubber coating. - Color variations of black, blue, red, silver, gray and white. - Dimensions: 67.8mm x 17.2mm x 7.7mm. - Aluminum body with glossy black plastic cap. - Color variations of black, blue, red, silver and grey. - Dimensions: 64.5mm x 16.8mm x 7.1mm. - Printable Area: 11mm x 43mm. - Brushed aluminum frame with leather body. - Color variations of black and brown. - Capacities: 128 – 512MB and 1 – 8GB. That’s it for the various D Series Memory Sticks. If you’re wondering about the company itself, I can tell you that Super Talent has been around for 20 years and was birthed by the Silicon Valley boom. Headquartered in San Jose, they’re specialized in memory technology and also produce SSD drives, RAM sticks and mp3 players. Now, if you have any experience with flash drives from Super Talent’s D series feel free to comment. Also, if you have better ideas for what the various abbreviations could mean, bring it on. Perhaps you actually know?